Best Bloody Mary money can buy in Madison. Never had a bad one no matter who makes it. Can't beat the ambiance of the historic The Fess Hotel. 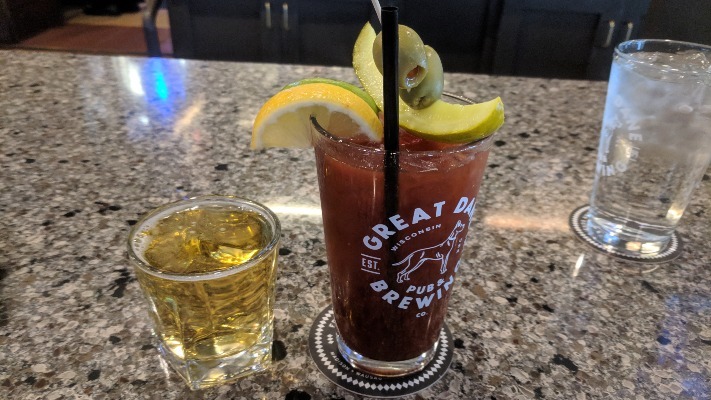 Great Bloody, mine was made with Absolut, and some interesting spices I couldn't quite figure out, although I think included dill, extra horseradish, and some pickle juice. Garnished with a somewhat sweet, yet tangy pickle that had a little kick, a couple of olives and an asparagus spear... it thoroughly exceeded my expectations. Chased with a full pint of Old Glory APA! What a way to start the day!